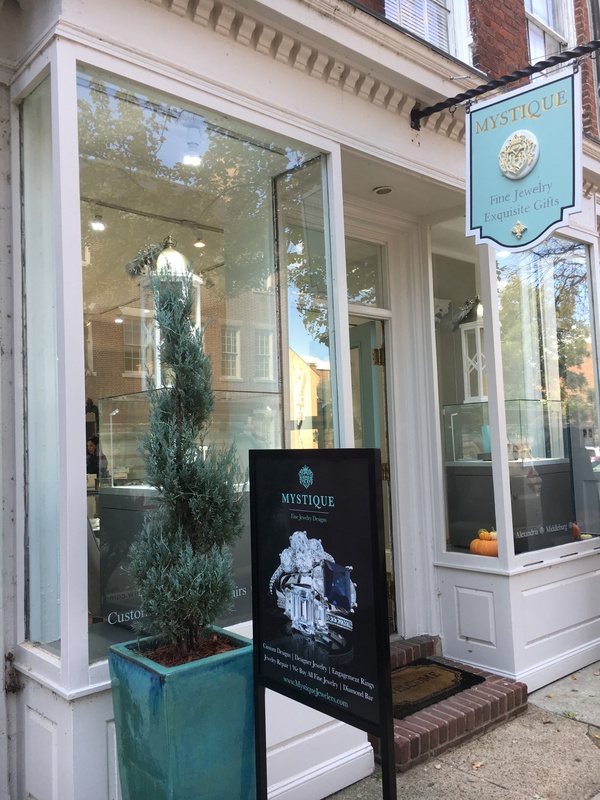 Mystique celebrates their 27th year in business in Old Town Alexandria this year and made a big move at the same time. After being at their original location on “The Strand” – the 1 block long street just south of Union Street where Chadwick’s and the Hotel Indigo’s patio are – they moved to 123 South Fairfax Street into the “Heart” of Old Town. This space was formerly occupied by another jewelry store for over 35 years, The Nugget. The Strand has been demolished and new construction has begun and moving the store was not in the plan, however, this change of locale has proved to be a nice step in the right direction. You know what they say…location, location, location. Mystique’s proprietor, Elizabeth “Liz” Mandros, has quite the story about how she got from majoring in drama to custom jewelry design and becoming a business owner. After interviewing her the other day, I decided she might be a good candidate for a future “Personality” Profile. This time, however, we want to concentrate on her pride and joy – Mystique Fine Jewelry and Design. Mandros is a local girl who is very passionate about her work, her horses and her jewelry and that passion certainly transcends into her business. Mystique is definitely a product of lots of hard work and pulling together the right mix of people. She is very complimentary of her employees and they obviously work like a real team. When I asked what set Mystique apart from other jewelry stores in the area, she said that she felt that the fact that they are always doing something different is the key. They don’t want to be compared to the Nordstoms/Neiman’s market. They spend an extraordinary amount of time hand picking pieces from various designers with current clients in mind as well as pieces that are timely and will appeal to new clientele. The inventory in the store is indicative of that. There are very conservative pieces and there are very creative pieces with several in between. Liz tells me that she likes to think she is a little “edgy” but not so far out that she can’t play in the mainstream and Mystique’s inventory reflects that. She wants to make sure that the pieces people purchase from her store are heirloom quality and that clients will want to pass them down. The Mystique team also designed the Crowned Salamander Collection for local celebrity, Sheila Johnson. Johnson is the proprietor of the popular Salamander Resort just outside of Middleburg, Virginia and is also the owner of D.C.’s very own women’s basketball team, the Mystics. Liz told me that it was a lot of fun doing the promotion for the collection since members of the team were the models – Mystic…Mystique. I think it’s catchy. The line is available at the resort and it is worth checking out. Something new that they added to the store when they made the move is their “Diamond Bar”. Mystique prides themselves on the selection and quality of their diamonds (Liz was a diamond buyer at one point) as well as the options one has for design and price point. They do both CAD and handcrafted designs and they want to be sure everyone feels special about their selection. They are very customer service oriented and Liz wants clients to enjoy shopping with Mystique as much as she enjoys what she’s doing. Trunk Shows are a big part of the Mystique business model. This affords the designers that they like to work with an opportunity to tell you about themselves and their products as well as the opportunity for you to ask questions. Just this last month they featured the designers from Armenta and Mazza and Lika. Be sure to check their website for those coming up in November. 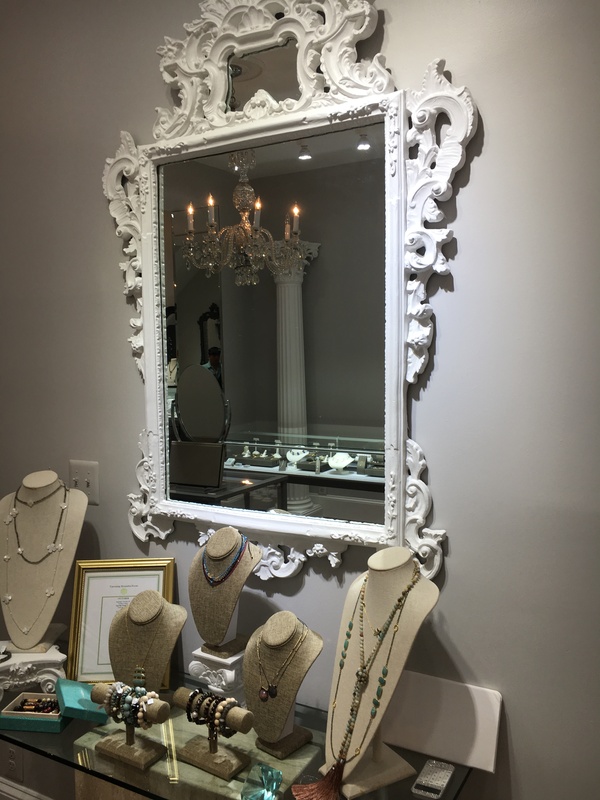 While the Old Town location is the prime place to shop, there is a second location at 112 West Washington Street in Middleburg, VA and their jewelry is available at the very popular Inn at Little Washington in Washington, VA. Visiting any of the locations is a treat since they are all located in historic areas with lots of other fabulous sites, shops and restaurants to take in. Stop in and check them out, you won’t be disappointed.